> You want a own olivewoodmarket or shop? You want a own olivewoodmarket or shop? Larger quantities and special prices for resellers on request always possible! 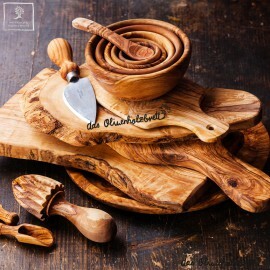 You would like to open an olive wood market yourself and become a partner? We are happy to supply olive wood retailers, dealers and specialized shops and offer interesting reseller offers at wholesale prices. We are happy to advise you in the complete preparation and organization of the new business branch and are always at your side with our experience. Simply send us an email to c.stangl@eat42.de and we will send you your individual offer. We are also happy to help you over the phone.